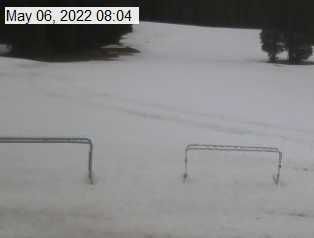 Our webcam shots are updated every two hours to show the current weather conditions at the base area. 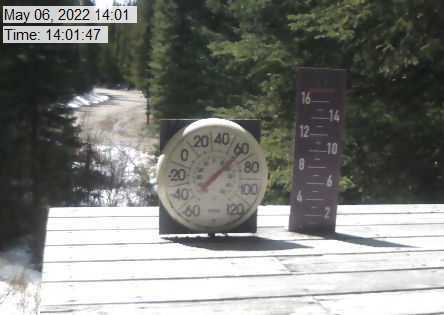 The pictures on the right are taken from the deck of Ski Patrol building and show current weather conditions (the thermometer has an 11" diameter and is mounted 3" off the deck). The photos on the left are looking east up Lums Run off the Easy Chair. Discovery has it all for any style skier, whether you are taking your first ride on the Jubilee or needing that adrenaline rush down the Limelight Bowl. Along with all the beginner to intermediate to double black diamond terrain, skiing is and can be dangerous. It is your responsibility to know your limits based on your abilities. Please don’t attempt to ski extreme terrain unless you are able and proficient. If you fall you must be able to immediately arrest your slide and proceed down the mountain. Skiing on extreme terrain when you are not capable can cause serious injury to yourself and others. This action may cause you to lose your lift ticket. Be advised that you cannot board a lift unless you have sufficient physical dexterity, ability and knowledge to negotiate or to use such lift safely, or until you have asked for and received information sufficient to enable you to load, ride and unload the lift safely. You may not use a lift or any ski trail when under the influence of drugs or alcohol. Discovery Ski Area stresses kids safety on chairlifts. For FAQ’s on chairlift safety for kids, check out KidsOnLifts.org. While snow safety and avalanche mitigation efforts help reduce the risk of avalanches, avalanches and snow slides may occur at ski areas, both inside and outside of the posted boundaries. Avalanches are inherent risk of the sport due to the nature of snow and its application on steep mountain terrain. Become educated on how to reduce the risk of injury or death from avalanches through your own actions and awareness. Visit www.avalanche.org for further information on the risks and prevention of avalanche-related injuries or death. Freestyle Terrain Areas are designated with an orange oval and may contain jumps, hits, ramps, banks, fun boxes, jibs, rails, half pipes, quarter pipes, snowcross, bump terrain and other constructed or natural terrain features. Prior to using Freestyle Terrain, you are responsible for familiarizing yourself with Freestyle Terrain and obeying all instructions, warnings and signs. Freestyle skills require maintaining control on the ground, and in the air. Use of Freestyle Terrain exposes you to the risk of serious injury or death. Inverted aerials are not recommended. You assume the risk. Make a plan: Everytime you use freestyle terrain, make a plan for each feature you want to use. Your speed, approach and take off will directly affect your maneuver and landing. Look before you leap: Every Scope around the jumps first, not over them. Know your landings are clear and clear yourself out of the landing area. Easy style it: Start small and work your way up. (Inverted aerials not recommended). Respect gets respect:From the lift line through the park. Each feature can be broken down into 4 zones. Identify these zones and have a plan before using any Freestyle Terrain. Discovery Ski Area encourages you to educate yourself on the benefits and limitations of helmets. If you choose to wear one, please ski or ride as if your are not wearing one. Every winter sport participant shares responsibility for his or her safety and for that of others using the ski area facilities. www.lidsonkids.org is a great resource for providing parents and other consumers with important helmet safety information complete with simple helmet sizing instructions to help ensure a proper fit. With the latest snow conditions, deals and news sent straight to your inbox. 9 A.M. - 4:00 P.M.
We look for fun, energetic seasonal employees. From running the lifts and grooming the slopes to teaching lessons and working in the café, there's more than a season pass waiting for you when you accept a job at Discovery. Discovery Ski Area is operated under a special use permit with the Beaverhead-Deerlodge National Forest and is an equal opportunity provider. Proudly powered by WordPress | Theme: pctheme by PartnersCreative.